Coconut water · Madinina, L'île aux fleurs, l'île des revenants, chalè, chalè !!! Coconut water rival the biggest brands of energy drinks ? It is indeed a real « drink of the effort », very rich in minerals. 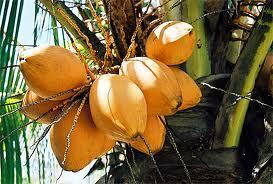 Coconut water is : 100ml for only 23 kcal, 280 mg potassium, 25 mg phosphorus, 24 mg calcium, 23 mg of magnesium. Coconut water, this source of strength, says a cutter with a coconut covered truck is installed at the outlet of a gym in Fort de France. The regulars, for most athletes, are convinced. With reason, because coconut water could get a place on the world market of energy drinks. Because it is now easy to bottle it. And that’s a real « drink of the effort », very rich in mineral salts « electrolyte » which allow a rapid muscle recovery. Its potassium content is particularly high, a glass of coconut water makes as much potassium as two large bananas. Even more than the major brands of sports drinks! But coconut water is not reserved for joggers or to elite athletes. West Indies, drink coconut water to the same fruit is also a very ancient practice, dating back probably to the seventeenth century, when the introduction of the coconut by the Spaniards. Today, the Commies are on every beach and every garden. There has to climb to pick them! It’s at the age of 6-8 months that large green nuts contain more water, up more than 800 ml. Water is always fresh, fragrant and refreshing whose virtues are appreciated for generations. 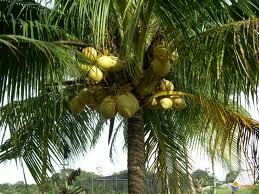 As professionals tout the cutters, coconut water is a diuretic, « it cleanses and purifies! « . It is also rich in vitamins and minerals but low in calories. Coconut water contains less than 5% carbohydrate (sucrose and sorbitol), ideal for those who are hunting pounds. The anthropologist Marie-Claire Bataille-Benguigui even writes that « this water is beneficial to the multiple effects a true gift of nature to man ». So, whether you are elite athletes or « couch potato », drink coconut water at will ! Once open the coconut, drink the water immediately, otherwise the liquid loses its nutritional rapidemment and ferments. While the high-temperature pasteurization (UHT) keeps coconut water but it loses its flavor and nutrients. This is the United Nations Food and Agriculture Organization (FAO) in 1997 who found the solution: « a new cold process that allows one to bottle coconut water biologically pure without losing its taste or nutritional properties « This process should be made freely available to manufacturers in tropical countries, which can then discover the benefits of coconut water to the world. Sterile, isotonic and rich in minerals (electrolytes in its composition is close to that of blood plasma), coconut water can replace the saline by intravenous infusion. During the Pacific War, between 1941 and 1945, the coconut water was also used for transfusions to wounded soldiers. And in 2001, in India, « plasma plant » has saved many victims of the earthquake in Gujarat.